Leafy spurge An identification video can be found here. The first step to prevention is learning to recognize an invasive plant. 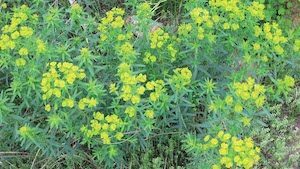 IPAW has several links to help you identify invasive plants and you are always welcome to email us a picture of the plant you are trying to identify. Once you have learned what invasive species look like, you can monitor natural areas. Monitoring is important, especially in the spring, to stop invasions. If you discover a NEW invasive plant species in your area of Wisconsin, please click on the link to report it here. Click here for more information on EDRR. To discourage invasive plant seed germination, maintain a dense cover of desirable native or non-invasive plants. Take steps to control invasive plants as soon as possible after an invasion is discovered. Keep in mind that optimum timing for control will vary from one species to the next. Prevent any of the invasive plants in a new infestation from producing seed or otherwise reproducing. Eliminating plants prior to seed development will prevent future generations from developing. Soil disturbance provides prime areas for invasive plants to grow from seeds. Make sure to minimize soil disturbances when pulling or digging plants. Cooperation with neighboring landowners makes control efforts more successful. Sharing information on the extent of invasions, site characteristics, and various control options is essential. Use the Best Management Practices (BMPs) link to find out more of what can be done to prevent the spread or introduction of an invasive species.